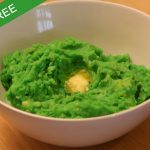 Have fun making this incredible green mash potato with cabbage and butter for a traditional St.Patricks’ Day dish. We used Wilton Colour Right colours but any gluten free colouring will work. Use about 7 times as much yellow as blue to get a really vibrant green.